The antique tea roses as well as wild roses in my yard are in full bloom. They look so beautiful I want to eat them. And, fortunately, I can since I don’t use any chemical pesticides in my garden. In the past, I have made cold strawberry rose petal soup and rose petal jelly. This time, I thought I would try making a beverage out of the blossoms. Inspired by a cold glass of lavender lemonade I had at J. Chocolatier in Georgetown yesterday, I thought I would try making my own version using roses. 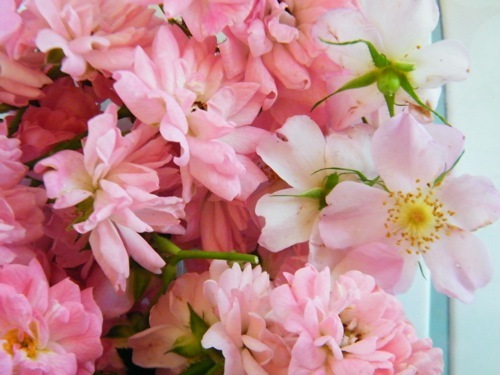 I picked the freshest-looking blooms in the late morning, after the dew had dried from them, choosing a mixture of antique tea and wild roses for a greater depth of flavor. I removed the stems and stamens, and tossed any petals that looked brown on the edges. In total, I collected enough petals to loosely pack 1 measuring cup. 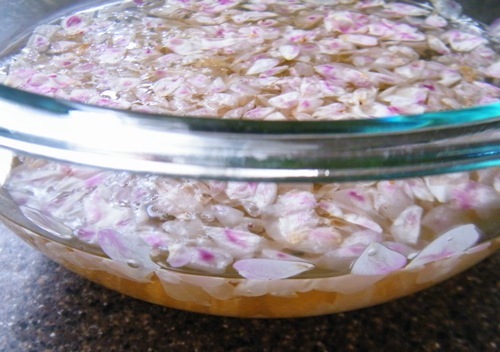 I placed the petals in a pyrex bowl and covered them with 2 cups of boiling water. I allowed the petals to steep for 30 minutes. While the rose petals were steeping, I thought it would be fun to make some embedded rose ice cubes. I used a silicone gem-shaped ice cube tray that I had bought a while ago, but never opened. It seemed like a great girly-girl touch for my lemonade. I also made some simple syrup from this New York Times recipe using organic Fair Trade sugar, then set it in the refrigerator to cool. 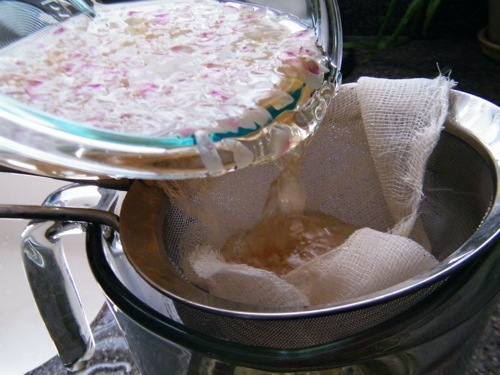 Once the rose petals were finished steeping, I strained the liquid through a cheesecloth into a measuring cup and placed it in the refrigerator to cool for an hour. After an hour had passed, I squeezed the juice of 3 lemons through a strainer into the rose petal tea. I stirred in the cooled simple syrup, added the rose petal ice cubes, and voila! Rose petal lemonade – a perfect summer drink. 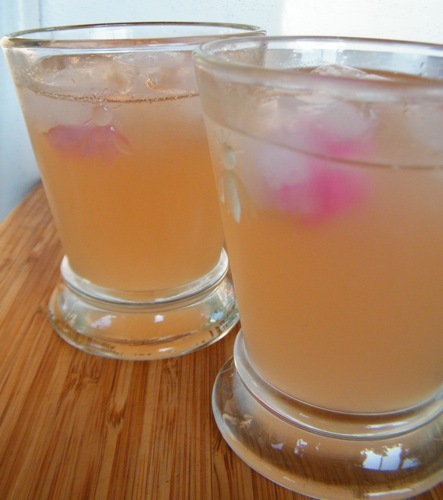 This entry was posted in food, herbal, recipes, tutorial and tagged lemonade, recipe, rose, rose ice cubes, rose lemonade, rose petal lemonade, rose petals by YourStellarSelf. Bookmark the permalink. Beautiful! I may go down the street and ask the neighbor whether or not they use spray. 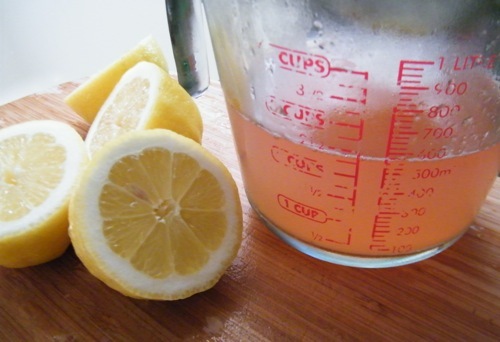 I make something very similar but I cheat and use purchased rose water, lemons and a little honey , I blend the whole lemon flesh in a blender with some water honey and rose water …its so yummy …I love your ice cubes with rose petals …..
That sounds absolutely delicious! I will definitely have to try your recipe! We have a lovely english cottage garden, with trails of wild roses,I usually wait for the rosehips to make ‘eglantine jam’ but I am really looking forward to trying this to sip in the garden on a summer afternoon;, although we are having an english summer and i think we will be in raincoats and wellies!. Thank you for the recipe and the beautiful pictures, The rosebud ice cubes are so pretty too! Your garden sounds lovely! I’m also a big fan of rosehip teas and jellies, and I am sure that you will love the rose petal recipe. Enjoy!